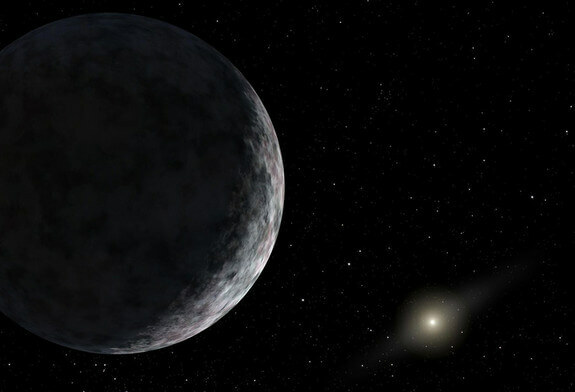 At least two planets larger than Earth likely lurk in the dark depths of space far beyond Pluto, just waiting to be discovered, a new analysis of the orbits of “extreme trans-Neptunian objects” (ETNOs) suggests. “This excess of objects with unexpected orbital parameters makes us believe that some invisible forces are altering the distribution of the orbital elements of the ETNOs, and we consider that the most probable explanation is that other unknown planets exist beyond Neptune and Pluto,” lead author Carlos de la Fuente Marcos, of the Complutense University of Madrid, said in a statement. “The exact number is uncertain, given that the data that we have is limited, but our calculations suggest that there are at least two planets, and probably more, within the confines of our solar system,” he added. The potential undiscovered worlds would be more massive than Earth, researchers said, and would lie about 200 AU or more from the sun — so far away that they’d be very difficult, if not impossible, to spot with current instruments. The new results — detailed in two papers in the journal Monthly Notices of the Royal Astronomical Society Letters — aren’t the first to lend credence to the possible existence of a so-called Planet X. In March 2014, Chadwick Trujillo and Scott Sheppard announced the discovery of 2012 VP113, an ETNO that never gets closer to the sun than 80 AU. 2012 VP113 thus joined Sedna as the two known denizens of the “inner Oort Cloud,” a far-flung and largely unexplored region of space beyond the Kuiper Belt (where Pluto lies). Trujillo and Sheppard suggested that the orbits of 2012 VP113 and Sedna are consistent with the continued presence of a big “perturber” — perhaps a planet 10 times more massive than Earth that lies 250 AU from the sun. However, the pair also stressed that other explanations are possible as well. For example, Sedna and 2012 VP113 may have been pushed out to their present positions by long-ago interactions with other stars in the sun’s birth cluster. The objects may also have been nabbed from another solar system during a stellar close encounter. “If it is confirmed, our results may be truly revolutionary for astronomy,” de la Fuente Marcos said.